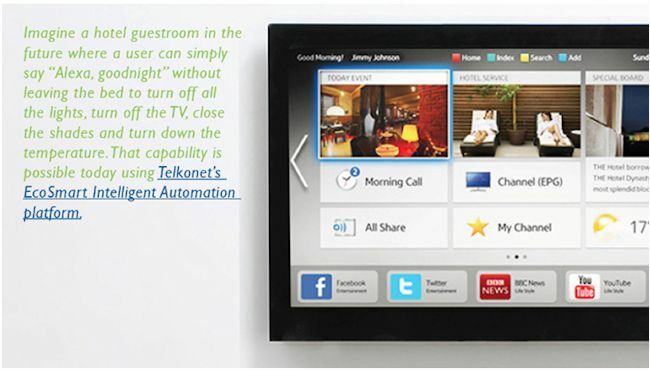 Telkonet’s EcoManage mobile application is shown above, providing guestroom controls always within reach. By: Jesse DePinto, Product Manager at Telkonet, Inc. There is no doubt that the Internet of Things will impact the way we do business today. Intel estimates that the number of connected devices will grow from two billion objects in 2006 to a projected 200 billion by 2020, or 26 smart objects for every human on Earth. Giants like GE are calling the Industrial Internet of Things the “Third Wave of Innovation” following the Industrial Revolution and the Internet Revolution. The hospitality industry possesses great potential for increasing revenue and decreasing expenses by integrating IoT technologies in their operations. For example, a smart energy management system knows when a guest room is unoccupied or unsold and can automatically adjust the temperature to reduce energy consumption by as much as 20 to 45 percent. At the same time, a smart energy management system could also increase the levels of guest satisfaction by allowing a guest to adjust the lights and temperature using their hotel loyalty apps, TV remote or even voice interaction, all without leaving the bed! 1. Guestroom Automation - In the past, hotels have had trouble keeping up with the rising bandwidth capabilities for their guest Wi-Fi network. Tomorrow, the challenge will be to maintain the same levels of comfort and control that travelers are accustomed to in their smart, connected home. Guestroom automation provides a way for hotels to differentiate by keeping up with the smart home technology to make the guest feel more comfortable. For example, Starwood Hotels & Resorts utilized a technique called “daylight harvesting” to save energy and increase indoor lighting consistency by automatically adjusting the energy-efficient LED lighting based on the natural light detected coming into the room. Other hotels use pre-defined “scenes” such as opening the shades & turning on the lights as soon as the guestroom door is opened. 2. Predictive Maintenance - Predictive maintenance takes preventative maintenance one-step further by using sensor data to recognize hazardous trends and alert the appropriate maintenance personnel before the issue escalates. For example, a Verdigris system uses machine-learning algorithms to identify the type of equipment that is in the network along with detecting abnormal usage by measuring its electrical characteristics using wireless sensors at the circuit panel. Jerry Dallaire, owner of Custom Energy Solutions, says “Maybe a room air conditioning system isn’t working correctly. The system will send an alert to hotel staff so it can be fixed while the guest is away from the room, before the problem is even recognized.” These predictive maintenance systems can even help a maintenance team work more efficiently by creating maintenance schedules based on actual usage and not estimated schedules, for example battery and air filter replacements. Companies like Hilton and Starwood are even offering their guests the ability to check in and unlock their doors all through their mobile apps using Bluetooth wireless communication. Using keyless entry, these brands are lowering their labor costs while increasing guest satisfaction all by saving time otherwise spent at the front desk. Platform companies like Telkonet’s EcoSmart boasts the ability for hotel brands to control the guestroom IoT products through the same guest loyalty apps that unlock the door, such as lights, power outlets & temperature settings. 4. Hyper-Personalization - More personal data is being shared between companies than ever before. For example, knowing that a Facebook user identifies themselves as “married” can help Google create more targeted advertising campaigns for that same user on Google’s search engine. Despite the obvious privacy concerns, 78 percent of consumers actually expressed a desire for some kind of content personalization, as opposed to receiving irrelevant ads. Personal data can also be used to provide the “personal touch” to hotel guests to make them feel special. For example, an IoT platform could over time memorize a guest’s specific comfort preferences and automatically setup the room for their next stay, such as: temperature, lights, TV channels & shades. The TV could even greet the guest by name as soon as they walk in the door to make them feel special. 5. Location-based Interactions - Location-based suggestions and interactions are now going digital, making it easier to deliver more valuable information to more guests than ever before. The front desk might be asked, “Where should I eat tonight?” or “How long does it take to drive to the airport from here?” By combining the data readily available on the internet and the question that the guest specifically needs answered, digital location-based interactions are more accurate than human-based interactions. It’s no wonder 30 percent of hotels in 2016 are allocating budgets for location-based technology. Hotels like the Fontainebleau Miami are using location-based data combined with PMS data to upsell guests through pre-arrival or checkout offers, such as a late stay. 6. Natural User Interfaces - Over the recent years, technology has become much easier for common people to use, thanks in part to the new burgeoning career of the User Experience Designer. The goal of a User Experience Designer is not only to make web and mobile apps more approachable, but also to consider the entire hotel experience and add in technology wherever it fits to make the hotel feel more like the guest’s home away from home. New interfaces for controlling the guestroom are emerging, such as control via bedside tablets and even voice control! Perhaps the most natural technology interface in the guestroom is through the TV. TV’s are so common that almost everyone knows how to use it. Since the TV is literally the focal point of the room, it could be used as a powerful tool for the guest to interact with technology in the room and even the front desk. For example, Samsung’s Hotel Management Solution & SINC entertainment solution provides a TV remote interface to control the thermostat, lights, shades and Do Not Disturb signs, along with checking weather and flight information. 7. API's & Third Party Integration - In order to make IoT a reality today, vendors must work together to bring these large systems online. Being a nascent technology, IoT still lacks clear standards overall. As the IoT market matures, vendor consolidation will likely occur, creating a smaller amount of vendors with more cohesive system offerings. Until then, integration will provide work for many, and API’s (Application Programming Interfaces) will be the lifeblood of an integrated IoT system. API’s are the interfaces between various unique software applications, allowing sensors, systems and platforms to securely communicate with one another. Right now, it's a safe bet to err on the side of openness to contribute more value to the larger, multi-faceted IoT systems. John Stiene, VP Innovation & Energy Services at Carrier Enterprise, says, "Companies that win in the future will be the ones that are hardware brand agnostic and act as a bridge to make all networked devices communicate together more seamlessly." At the end of the day, the Internet of Things is just another tool to help hotels and resorts satisfy their customers. Even though we are confident that the Internet of Things will level the playing field and shake up the industry, there will of course be many other ways to remain competitive. Even after this technology wave hits, people will still need to travel and they will still value superior comfort and customer service. As always, a customer focus will always make good business sense. The full PDF of this whitepaper can be downloaded for free here or via the PDF icon below. Telkonet, Inc. offers EcoSmart energy management technology as well as EthoStream high-speed Internet access solutions. Both product lines satisfy Telkonet's commitment to product innovation and technological expertise, and have been installed in several hundred thousand rooms worldwide. Telkonet's EcoSmart products, along with the EcoCentral management platform, reduce energy consumption, HVAC runtime and utility costs in most building environments. 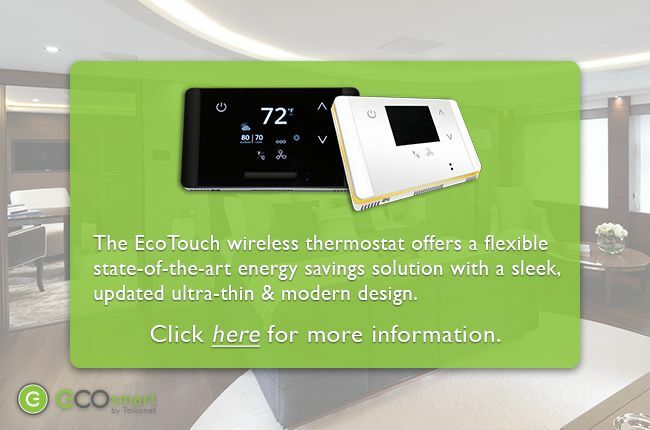 All EcoSmart systems feature Recovery Time™, technology designed to maximize energy efficiency without compromising room comfort. EcoSmart enables customers to take complete control of energy management with cutting-edge technology, real-time analytics, and participation in demand/response programs. Telkonet's energy management products have the power to counteract rising energy bills, minimize carbon footprints, and help eliminate the need for the construction of new power plants by simply maximizing energy efficiency. EthoStream, the high-speed Internet access division of Telkonet, operates the largest hospitality HSIA network in the country, supporting over 5 million users monthly. With a wide range of product and service offerings and one of the most comprehensive management platforms available for HSIA networks, EthoStream offers solutions for any public access location.